Rob, there is a limit to how fast the adhesion limit of a given tire will allow you to accelerate. After that, you won't get any more performance without improving traction. We found that after a certain point, the Miatas just sent the tires up in smoke and you could literally have doubled the power with out receiving significant improvement in acceleration in return (plus the added power would make the car snaky unless you had an educated right foot, something many seem to lack). You'd know far better than I where the performance limit is on a given Solstice tire. The current Z07 runs 335x25-20 tires. Wonder if you could get those under there somehow? What size are you running? 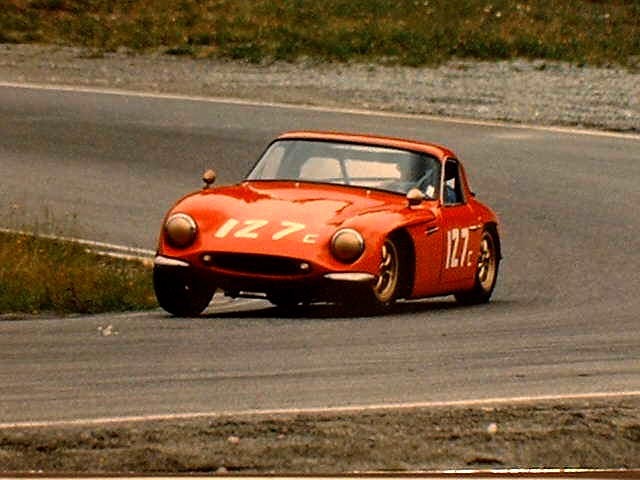 The Solstice has a wheelbase of 95"
One of my old race cars, a 1963 TVR Grantura, had a wheelbase of 85.5". I ran it with a bored out 1950 cc 4 cylinder and it was a handful - imagine how they handled with the Ford 289 up front. We people that used to ride motorcycles a lot in the past had the same type of problems. There was a time before electronics on sportbikes where we could get close to 200 hp on a one liter bike. Try to get that to hook up without putting yourself on you head. Electronics on a bike really helps with that problem but they can still get real scary real easy. In almost every case I actually preferred a 600 to a liter bike because it was just so much easier to ride that in most cases you were just faster on them. Now granted, a highly skilled, professional rider is probably going to be faster on that liter bike but most of us (probably 99%) just can't ride like that. I've never driven a Solstice with 500+ horsepower but my guess is that somewhere around that hp mark it starts to get much like the problem with the 600/1000 bikes. You guys probably aren't old enough to remember this, but the Kawasaki 500 Mach III had a 1/4 mile time of a tuned Solstice amd left untold numbers of riders plastered over the landscape with only 60 bhp. Bill remember when Kawasaki came out with the 750 two stroke and people were flopping them over backwards at an alarming rate. I think they were the end of the Kawasaki 2 stroke era for street bikes. I know blew a 427 apart trying to beat one in Omaha right after they hit the streets. If you could ride, they were ungodly on the street back then. Here is a short ride along, it begins at about the 1.19 point of the video. I mentioned skill of driving one of these high horsepower cars, and no way did I intend to insinuate that I had it. For me, that much horsepower is useless in the car. It looks neat, sounds kool, but beyond that a real driver with a 2.0 on a real twisty road course would kill it I think. Just too uncontrollable. Now mine does not have traction control and that maybe the major factor between some of the newer ones. Not sure. For me it is a toy, with a very sharp point. Not to be played with unless you have the ability to. I don't, I know it and readily admit it. Last edited by skersfan; 07-06-2016 at 08:34 PM. Not to belabor the point, but current bone-stock liter bikes are deep into the 9's with 600's about a second or so slower in the quarter. So yea, like Bill said "Modern super bikes are just nucking futs..." Something tells me a 600 - 700 hp solstice would be similarly hard to control. Anyone wants to lend me one for an afternoon though, I'll give it a try. It's much quicker than it was as a 2.0. Yeah, bikes are simply unbelievably crazy now. I'm actually glad that I made a pact with my wife that if I gave up motorcycles she wouldn't complain about me road racing. They also did a BMW S1000RR vs Ariel Atom V8 contest that was fun, but no everyone has access to 500 bhp sports racing cars built to be street legal! I believe that all your statements about traction issues apply fully to cars without TC and stability control. Personally I would not enjoy trying to drive a car as light as ours and closely coupled without them. We had one V8 car at the Nationals go out of control and end up in the medium from a stop turning left due to loss of traction. And a stuck shoe. It was a converted NA without all the above. [QUOTE=wspohn;1859841]You guys probably aren't old enough to remember this, but the Kawasaki 500 Mach III had a 1/4 mile time of a tuned Solstice amd left untold numbers of riders plastered over the landscape with only 60 bhp. Hey Bill I'm old enough to remember the Mach III bought one new in 1971 after that a succession of Z1 900s the last being a tricked out cafe racer that I built God those bikes were fast for the time ! TC and Electronic Stability Control were not available on 2.4 NA Solstices during model years 2006 and 2007. They were optional in 2008. They were standard in 2009. Both were standard in all years for the GXPs. I think that is the main reason I don't like driving mine. It was like a light switch, then CBM detuned it to redline at 5200. Dave worked on it at the National, brought the redline back to 7200, and made it a world better. I have driven it more now after DDM worked on it. It seems far more controllable now. Still way over the top for the average daily driver. Isn't your car making 460HP?